To Prepare the Cookies: In the bowl of a mixer, beat the butter on medium speed until creamy. Reduce speed to lowest setting and gently add the confectioners’ sugar and baking powder. Continue mixing until everything is incorporated. Add the flour, one cup at a time, and then the egg yolks, one at a time; continue beating for a minute. Pour in the water and continue mixing until the dough is smooth and can form a ball. Wrap the dough in plastic wrap and place it in the refrigerator. Let it cool until it hardens enough to be manageable, at least 1/2 hour (can refrigerate up to a couple of days). When ready to bake, preheat the oven to 375 degrees and cover a baking sheet with parchment paper. Place half the dough on a piece of lightly floured parchment paper, sprinkle some flour over it and then place another piece of parchment paper on top. Use a rolling pin to gently roll out the dough, to about 1/4-inch thick. Remove the top piece of parchment paper and cut out circles with a round, 3-inch cookie cutter. With a smaller cookie cutter, make a circular indention in the middle of each cookie, without cutting all the way through the dough (there should be about a 1/4-inch space between the indentation and the edge). 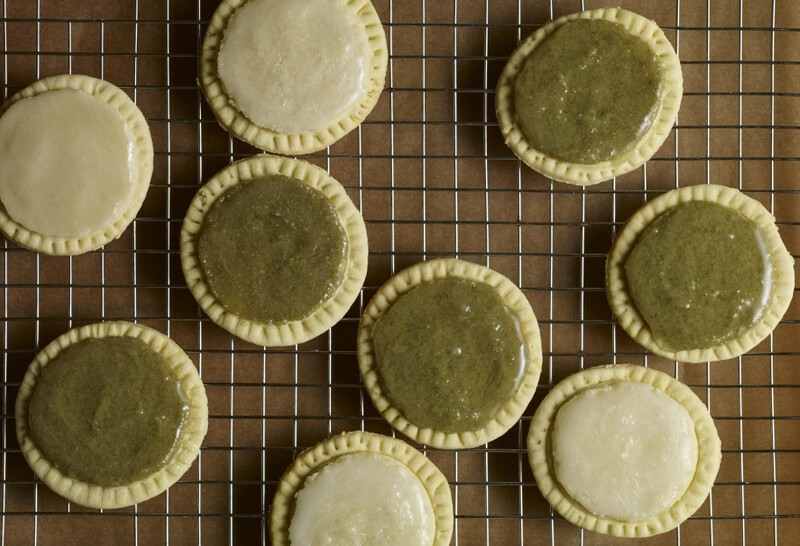 Press the edges of each cookie with a fork, as if marking the edges of a pie. Repeat the process with the remaining dough and roll it out again, making as many cookies as possible. Space the cookies at least 1/4-inch apart on a cookie sheet and bake for about 10 minutes, until they are fully cooked and the bottoms are lightly browned. Remove from the oven and let cool; repeat with the remaining cookies. Bring water to a boil in a small saucepan, add pumpkin seeds, simmer about 5 minutes and turn off the heat. Let it cool, stir in baking soda or powder and let it sit overnight. With your hands, rub the pumpkin seeds between your fingers and thumbs to try to release their skins. The skins will float in the water. Carefully pour off the water, cover again with clean water and drain again. With a slotted spatula, place the pumpkin seeds on a clean kitchen towel, rubbing them so that the remaining skins come entirely off. Place the seeds in a bowl, cover them with water, rinse and place them on a cloth towel or paper towels to dry. Place hulled, unsalted pumpkin seeds in the jar of a blender or food processor and grind completely. Place already-blanched, slivered almonds in the jar of a blender or food processor and grind completely. To Prepare the Glaze: In a medium saucepan, place the sugar and 1/4 cup of water over medium low heat. Cook until the sugar has completely melted into the water, is no longer granulated and appears to be light syrup, 8 to 10 minutes. Add the ground pumpkin seeds or almonds and stir well, creating a thick paste. Let the mixture cook for another 3 to 4 minutes — it will thicken and become even more pasty. Turn off the heat, pour in the milk and stir well. It should be thick yet shiny and a bit more liquid. Remove the mixture from the heat and let it cool until it slightly thickens and can top the cookie without spilling all over. It will spread as it settles, but if it has cooled enough it will not be too runny. Yet, before it completely cools and hardens. If it does harden, just heat the mixture over low heat with a tablespoon of water until it becomes runny again. To Assemble the Cookies: Once the cookies have cooled, add about one tablespoon glaze to each cookie.